A considerable amount of publicity has been directed recently to the trial in Bergen-Belsen of that camps’ commander Joseph Kramer, a professional friend of the accused. This man acquired the nickname “The Beast of Belsen” which illustrated this individual’s behaviour. I have taken part in these proceedings in Belsen, representing the Government of Poland, and I can testify that in the case of Kramer, not a single incident of murder by Kramer personally, has been proven in court. This in itself clearly illustrates the comparison of these two professional friends. The “Beast of Belsen” pales into insignificance in comparison to the accused Amon Goeth. This simple comparison requires special attention, in view of the fact that these proceedings are taking place not just to ensure that the accused is accredited his rightful justice, not only in order to expose the conscience of these Germans, not only to illustrate to the whole world, the real face of Nazism, but primarily, and above all to project the important messages of warning to our future generations. These present proceedings are the first in the world where the accused is directly charged for mass murder, which apparently became the German customary mode of behaviour in the extermination plan they were following. In addition, this case is only another link in the chain begun in Nuremberg, in order to create a new world order for peace among nations with penal codes internationally established to punish those who err. It is totally unnecessary to repeat the definitions of the crimes, as the most important factor in our deliberations will be the defence of human rights, of the individual as such, of a human being who must under no circumstances be violated but defended by every conceivable law, coupled with the conscience of the entire world. In this code, we will regard with the gravest gravity the crimes against mankind, a crime that is abhorrent to every decent human being, without exception to nationality, religion or race. This is the primary objective of this case. In the framework of the activities of the accused Goeth, in particular his personal and direct involvement in mass murder, however clear, is only but a fragment of the whole matter. In order to recognise fully, understand and appraise the activities of the accused Goeth, it is our duty as prosecutors in this Tribunal, to introduce to you, the whole system of murder, thought out, and introduced by the Germans, into the life of our country. The full might of these cruel German measures, were directed against the Jewish population. No other nation has been subjected to such crimes, so clearly and directly, as the Jewish nation. The accused Goeth planned the layout of the camp in Plaszow, in such a way to screen the activities within the camp from the outside. All barracks were positioned in order to block the view. It was common knowledge in the vicinity of the camp, that the murder of the entire population of southern Poland, was the prime objective of the Nazi SS. The Germans were justifying these activities, of progressive oppression and murder of Jews, for no other reason, than because they were Jews, and as such, had no right to live. The Nazis, had of course plans for the murder of other people as well, these plans were never put into action, in anywhere near the proportions, that have been reached, in the measures against the Jewish population. The extermination program of the Jewish population was executed thoroughly, and swiftly, all over Europe, and it befell upon Poland, to be the recipient of all the corpses followed by the ashes of the victims that have perished. It is the task of the prosecution, to present to the Tribunal, the complete mechanism of the murderous machine in action. It therefore rightly follows, that every detail be established by experts, which will confirm the chain of command, and the degree of responsibility of the subordinates. The basic investigations for this purpose have been carried out by the Main State War Crimes Investigation Commission, in conjunction with the Krakow District War Crimes team, dealing with the German atrocities. In this respect, very thorough investigations have been conducted by the Jewish Historical Committee, it is therefore right, that Mr Borwicz, director of this organisation, be invited to provide expert evidence in these matters, representing the people who suffered the most, due to the activities of the accused Goeth. I must however, emphasise, that in this case, as the accusing victims, the Polish nation stands side by side, with the Jewish nation, to see that justice be done. Not only because there were countless Polish victims in Plaszow, not only because, with the exception of a few transports of Jews from outside of Poland, who whilst indeed being practising Jews, were nevertheless in every way, rightful citizens of the Polish state, its culture and its traditions. 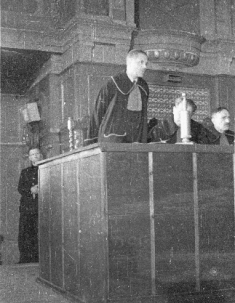 The prosecution therefore requests, that acting in the name of Poland, the accused Amon Goeth, be tried and sentenced by this Court, in the name of the Polish Republic. In addition, I would request that the name of Mr J. Sowinski be added to the list of witnesses, who is at the moment detained in the prison of Slupsk. The prosecution will prove, that the accused Goeth, allowed himself the murder of Chilowicz and his entire family. Chilowicz was the Aelteste (Jewish Leader of the Camp) in Krakow – Plaszow. His murder is rather interesting, as Goeth induced Chilowicz to escape, and during this attempt, Goeth personally murdered him and his whole family, taking of course all the valuables that they had in their possession, in order to assist them in the escape. The evidence to this, is also available from Jewish witnesses, who were, during the material time in the camp. 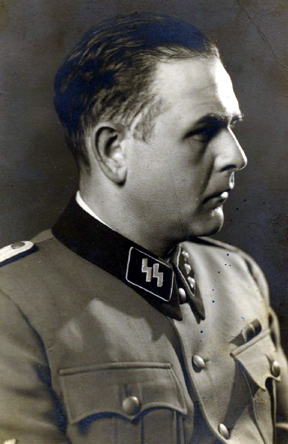 I have asked for the name of Mr Sowinski to be added to the list of witnesses, as only yesterday it emerged that he found himself among the guards of the camp in Plaszow, although of Polish origin, he voluntarily confirmed, that he knew every detail of the escape of Chilowicz, and the subsequent murder of the entire family, at the hands of the accused Goeth. 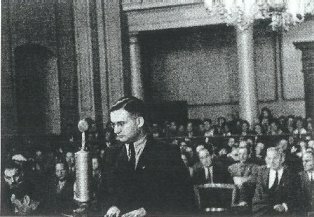 Following the speeches of the prosecution, there followed addresses by the defence council; Dr Pokorny. First of all on my own behalf, and also on behalf of Dr Jakubowski, I would once again publicly request that we be relieved by the court from the appointed defence of the accused. The accused Goeth is a German, the accused is a member of a nation that completely without precedent, committed crimes of unheard proportions, with the most serious intention of eliminating whole nations, certainly the citizens of Poland and the Jewish nation in particular. In view of the fact that we belong to the population directly affected, we feel that the responsibility, and duty of the defence, forces us to suppress our personal views, convictions and feelings. The fulfilling of these responsibilities by us, as Poles becomes extremely difficult and that is the reason we beg the court to be relieved from this task. Irrespective of this, we did have a conference with the accused Goeth, on the 21st of this month, and on his request have placed a written request for a specific number of witnesses to be called on behalf of the accused, in order to assist him in his defence. Among others, the accused asks for Dr Leon Gross, who is at the moment detained in the prison of Montelupich 7, as well as Mr Biberstein, doctor of medicine practicing in Krakow, No 38 Dluga Str, who will no doubt testify of the sporadic incidents of murder that occurred. The killing affected those who breached the camp discipline, those who were found in possession of firearms or explosives or those who assisted or attempted to escape. When asked how firearms or explosives could possibly be found in the camp, the accused replied that in the camp, were established tailoring workshops for the repair of army uniforms. Among the uniforms sent back for repair, ammunition, hand grenades etc were very often left by the soldiers. In addition, these witnesses will testify that in the grounds of the camp under his command, sentences of police courts were carried out - sentences of death given by various other police authorities that the accused Goeth could not dispute. We would also call Mr M. Pemper, who is testify that the accused did breed dogs, not for purposes of cruelty, but simply for breeding. The only time anyone was hurt by these dogs, was when they were not careful when approaching them, or when they ignored notices clearly indicating the danger when approaching their kennels.